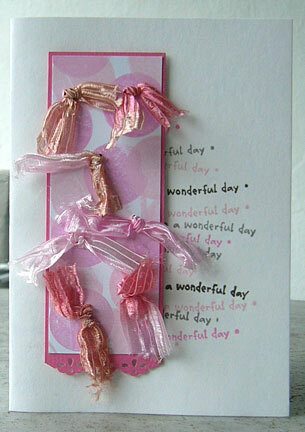 Embellish Your Cards With Ribbons! 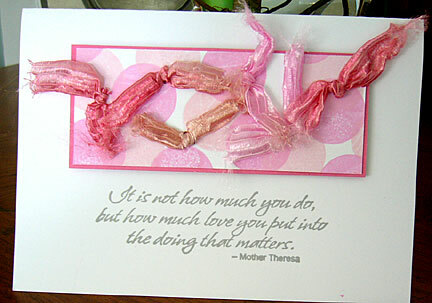 I went wild embellishing these handmade cards with ribbons. My brother gave me some pretty ribbons which he bought back from his travels. 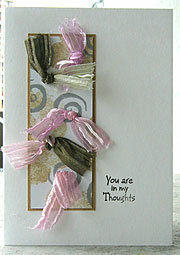 They are so pretty that there and then I decided to make some cards and add ribbons as embellishment. I made these cards within a day and enjoyed it so much that I decided to put a challenge to the group to come up with more cards embellished with ribbons. So hopefully, I'll be able to add more to this page - other cards with ribbons by readers of this website. So stay tune and be back for more ribbon cards ideas. See how I went wild with the ribbon. I cut a piece of cardstock and stick double-sided tape behind on the edges. Then cut ribbons a bit longer than the width of the cardstock, stretched across and sticked down with the tape behind. Then cut some flowers from another ribbon and glue to the stretched ribbons. Finally, taped it down on the card with double-sided tape and stamp the message, 'It is not how much you do, but how much love you put into the doing that matters. ~ Mother Theresa' just below it. Above is another of my collection of cards with colourful ribbons. I stamped some circles on the small piece of card stock. Punched holes in different places and tie ribbons. Then layered the card over a piece of colour cardstock. 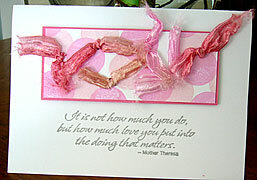 Taped it down onto the white blank card and stamped the Mother Theresa's quote just like the one above. Another variation of my collection of ribbon embellished cards. Here, I punched a decorative edge and taped it down on the card vertically. But before doing so, I stamped 'have a wonderful day' in different color on the right side of the card. The above card is the same as the one before but using different color ribbons and with only the message You are in my thought' stamped in black on the botton right. 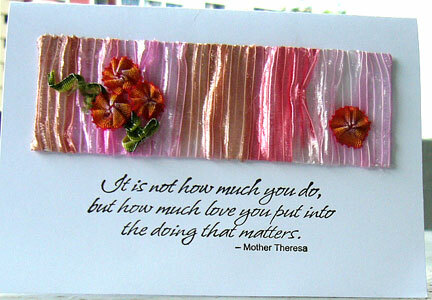 The flowers for this handmade card is taken from a ribbon. I cut out just the flowers and pasted them on the white card. 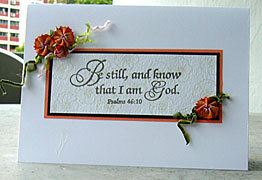 The stamped message, 'Be still and know that I am God. Psalm 46:10' was layered onto the card with double-sided tape. Stamp Credit : Biblical Impression?